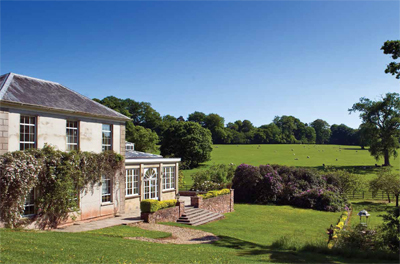 Easterlands is an impressive country property overlooking its own rolling parkland on the Somerset/Devon border. Although it was probably built in the late 19th Century, the architectural style harks back to the Georgian era, with rendered elevations under a slate and leaded roof. This property has been in the same ownership for about 35 years and would now benefit from being updated. Inside, the reception rooms are well-proportioned with high ceilings and elegant detailing, including substantial fireplaces and panelling. The conservatory and billiards room are particularly impressive. Upstairs the bedrooms are nearly all arranged with en-suite bathrooms, while the cellars beneath the house offer plenty of usable accommodation. To the rear of the house is the stable courtyard with the Old Coach House with stables and garaging. Behind that the walled garden is well stocked and beyond again the swimming pool complex and tennis court are well screened but easily reached from the house. The two bedroom staff cottage and barns can be accessed from a spur off the drive. 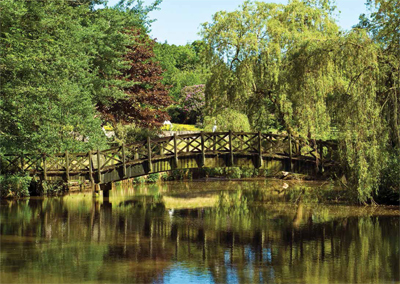 Outside, the gardens include lawns, borders and a stream-fed lake with an island reached by an attractive arched bridge. There is also a walled garden, a hedged kitchen garden and a greenhouse with an orchard behind. The leisure area includes the swimming pool and an adjoining hard tennis court. The parkland contains some fine specimen oak trees, four smaller railed paddocks and two holding paddocks more suitable for horses – the land comes to around 44 acres. There is the potential to re-establish vineyards in the grounds. From the top of the land there are views over the surrounding Taunton Vale, Blackdown Hills and Wellington Monument and down to the village of Sampford Arundel. The property is situated amidst the verdant rolling countryside on the Devon/Somerset border at the foot of the Blackdown Hills, conveniently close to both the M5 and nine miles from Taunton. The guide price is £3.1m. To find out more please contact Savills on 01392 455 700 or visit www.savills.co.uk.